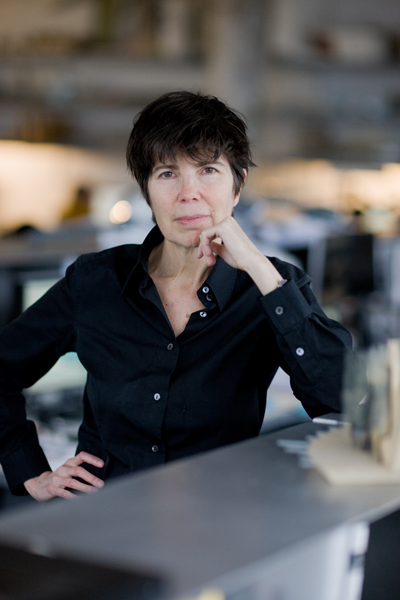 For the third installment in the 2011 Domus interview series, I spoke with Elizabeth Diller, the co-founder of Diller Scofido + Renfro, a multidisciplinary studio based in New York. Equal parts artist, architect, and academic, Diller has produced a body of work that resists easy classification. For more than twenty years, she, together with her partner Ricardo Scofidio, has engaged in a series of ongoing spatial experiments, played out in buildings, theatres, galleries, books, boardrooms, and class rooms. We talked about this varied output, smart and dumb technology, and New York’s testosterone-fueled architecture. It’s interesting that you say you made your own context as a teenager, because it seems to me that you’ve done something similar as a professional. You’ve managed to straddle architecture and art and use the qualities of one to challenge the other. Do you consider that a continuation of the cultural experiments you started as a teen? I’m not sure what the direct correspondence is, but perhaps it’s my unwillingness to define specific boundaries in the discipline. After studying art and then studying architecture, I never needed the clarity of either being a professional architect or being an artist, and found some kind of middle ground that was contaminated from all sides. I felt very comfortable in the middle of everything. Perhaps that’s had some kind of lasting influence. I never really thought much about that, but I’m very comfortable between borders. I’m curious to hear more about your studies. In the past, you’ve mentioned that [former Cooper Union Dean of Architecture] John Hejduk inspired your interest in architecture. Could you describe how that happened? When I was a young student I was studying art and I decided to check out the architecture school. The Cooper Union was a great art school and a great architecture school. I just wandered into the architecture school and I noticed this guy John Hejduk who was an incredibly compelling personality. He opened the door for me to understand architecture as a cultural discipline – before that it had seemed to me just a profession. When I got a sense of him I realized that I should really study in the architecture school; it was a better fit for me. My parents always wanted to channel my artistic skills and interests into the profession of architecture. They thought that it was a good way to make an income and to have a job. They thought that it was, somehow, a natural extension of what I was already interested in. But I had absolutely no interest. [Laughs] And the fact that they wanted that future for me made me want to resist it more. But then, later on, I came upon architecture in another form through John Hejduk, who exposed it to me as a way of analytical and creative thinking. So I decided to major in architecture and I transferred from the art school to the architecture school. But I never really wanted to give my parents the satisfaction of knowing that, so they didn’t really know that I graduated with an architecture degree until my last day of school. I was basically allergic to the idea of following my interests because architecture was a profession. So when I finally graduated I never had the intention of becoming a professional architect, making buildings and such. I was interested in doing work around space and culture but that could use any media, at any scale, and didn’t need a client. So I was oriented already to do independent work in the form of installations in public space. That’s a really roundabout way of answering your question, but I think it fills in a couple of blanks. This early work that you describe as being capable of incorporating any media, operating at any scale and being, in a way, unprofessional or counter-professional is very interesting to me, particularly since this interview is for a Chinese magazine. For many years, your studio didn’t build buildings and concentrated on visual arts, performance art, theatre, and academics. I have the sense that this is partly due to your own choice and partly due to the fact that architectural work was scarce when your studio opened. In China, architectural work is abundant, so much so that conceptual and critical exploration is pushed aside to pursue more pressing professional and financial gains. It seems to me that your practice is, in a way, an argument for the value of taking time to develop your ideas before assuming the burden of building. It was an opportunity for me to take my academic world and expand it into some form of dissident practice. My interests were varied and there were many trajectories in the early work that still continue into the current work and now appear at many different scales. For me it is unimaginable to just start building right away. If I had done that I would have never had the opportunity to take a critical stand – to challenge the conventions and to question what the discipline actually is and how it interacts with other cultural disciplines. With that said, for many years we were willfully doing independent projects – not because the work wasn’t coming our way, it was just because we weren’t really thinking about career paths that ended up with buildings. The paths had more to do with focussed research. And then it turned out that doing architecture, building buildings, was just one of the trajectories that we wanted to pursue, but never at the cost of doing the other work. The independent work continues – performance, exhibitions, installation, public art and all of that, it’s just that now we have the opportunity to do more things at different scales and different levels of permanence and different complexity levels, and so forth. But I think to shortcut that process would have have been for me personally to lose the edge around the work. You mention that your early work was inspired by focussed research and I know that you still describe your practice as research-based. Could you identify the main areas of inquiry? They are pretty broad. One very broad one is the relationship between smart and dumb technology, high technologies and low technologies. In the case of architecture, bricks and mortar versus intelligent systems – that’s one thing that has always been of interest. Another trajectory of research has been around the issue of mediated versus authentic experience. The criticism that there are cultural values that get mediated away because of new technologies is something that we very much resist; we are interested in new materials and experimenting with new forms and even new techniques without placing values on them. Another trajectory is visuality or the culture of vision, which embraces issues of power, exhibitionism and voyeurism, as well was more scientific and perceptual issues. This is something that is locked into a lot of our work and continues today. We’re also interested in interdisciplinarity and all of our work tries to merge multiple disciplines. Sometimes we don’t have the expertise but we bring it into projects. We’re always working with choreographers and directors, robotics experts and different kinds of scientists and researchers. We’re always interested in the links and crossovers between disciplines. I could go on and on. There are many trajectories that we don’t feel are concluded research. They are ongoing and they are also methodologies that persist since we started. We don’t have preconceived ideas; we work, we analyze, we read, we step into projects knowing that we’re not the first ones there. We don’t believe in tabula raza, we like to situate ourselves within history and within the discourse, then take an opinion and proceed forward. That way of working has always been the way we do things. You’ve said that there are many more, but for the moment let’s stick with the four research trajectories that you’ve just identified. Could you offer an example from your work to illustrate how you’ve pursued them? To begin with high and low tech: is there a particular project that you feel pushed your thinking forward in this area? One of our earliest projects, Indigestion, was an interactive media project that involved a projection of a meal onto a table. The viewer could select from different diners and the script was written in a way that produces different kinds of interactions. That was, at a very early stage, meant to critique the empowerment of the audience to interact with something that had already been pre-scripted. It was done at a time when there was a lot of rhetoric around how technologies would change everything, how technologies would entirely transform cultural conditions. We were looking at everything with a certain skepticism while embracing technology. We were very cognizant of how much artistic practice could be divorced from the author, even though in that particular piece there was an implication of the audience being an equal part. That was an very early example of looking at that issue critically. An intermediate example would be the Blur Building [the media pavilion we designed for Swiss Expo 2002] where we got interested in producing weather by combining available materials like water with certain responsive technologies to capture water and filter it and force it out of fog nozzles in order to produce an effect that was constantly changing. It was an early form of artificial intelligence where sensors around the Blur Building were constantly picking up the actual weather conditions to be able to fabricate artificial weather conditions using the water. We were able to make a big cloud that responded to humidity and air temperature, dew point, and all of that. So that was a similar trajectory there. We just did a piece at the Cartier Foundation on human migration, an in-the-round media piece where the public was inside of an immersive video projection. The content had to do with human migration for economic, political, and environmental reasons. Forty-five minutes worth of content in the round was delivered in a digital graphic way that was created through data. We produced a lot of intertwined connections between these facets of politics, economics, and environment but through projection and a form of programming that allowed us to pick up only hard data to produce effects and stories that were not image-based. We’re basically making a forty-five minute movie without resorting to pictorial or narrative structures, using only ,data-driven graphics. One of our earliest, well-known projects was the Slow House. That house was in a very beautiful site on the edge of a bluff facing the ocean. The contention of the house was that a window is every bit as mediated as a video. If we take a look at a beautiful sunset over the horizon without any artifice, that’s one thing. If we look at it through a picture window in a house, the view is already mediated by the fact that the window frames it. Then if we take a video of that view and broadcast it live in the house we will be looking at another mediated view. What makes one form of mediation different or better than other? That was the rhetorical point that that house made. We still think about those things. A lot of our work in the theatre involves performers that are a crossover between live and mediated performers. In Jetlag [the theatre piece we produced together with the Builders Association performance company] the protagonists have a presence onstage in media form and they move to physical bodies onstage and they record their voices and then play themselves back. They are part of the presentation of themselves to the audience. Moving Target, another theatrical piece, had a large, forty-five degree mirror over the stage that allowed the audience to see the actual performance on stage perspectivally, to see the plan view via this mirror that turned everything ninety degrees. We are very interested in that sort of splintered perception and the reinforcement of one and the other. It’s not a matter of substituting one or the other, it’s a matter of having them occupy our world without positive or negative value. One more project – the ICA in Boston. The building is located right on the edge the harbor and it basically analyzes the view and distributes it in small doses in different parts of the building. It’s very much an apparatus, just like the Slow House, for producing and re-producing ways to mediate the surroundings. So that notion of mediation is really in every project. In The Brasserie [a re-design of Philip Johnson’s restaurant in the Seagram’s Building] every entry though the revolving door from the street is captured as a snapshot and put onto a video beam that basically announces every entrance into the restaurant and broadcasts it to everyone inside. I could go on and on. What you are describing are ways to incorporate media within a building or creative space, but once you’ve completed a work it becomes a subject of media itself. I think that has strong implications on some of your works because they tend to experiment with meaning and material and often strive to resist easy representation. The Blur Building in particular has always seemed to me a very tricky work to capture through media because, as you’ve said, it uses water as a building material and produces effects that can’t be captured by photography or video. Nevertheless photos remain the primary means through which people are exposed to buildings. What are your thoughts on the state of architecture photography, and what alternative means of representation could you imagine to provide a fuller sense of experience? Blur is a really good case in point of a project that had a very short duration. It was ephemera all the way: the building material was not solid, it was there but not there, it was constantly dynamic and ever-changing, and it was intended to only have a six-month life. In the end, the Swiss government wanted to save it and make it a permanent monument, but we wanted nothing more than to blow it up and have it dissolve as it had appeared. In that case, there are people who visited it and have memories of it, feel fondly about it and I certainly am one of those. But the photographs remain and people also connect with them. Many, many people have discussed it and many articles have been written by people who have never seen the actual Blur Building. I like to think of photography as an end in itself – it’s not just a way to preserve something that’s no longer there. We actually like to think about making many manifestations of the same project. Early drawings before a project is realized – and maybe the project is never realized – are a manifestation of an architecture. The built project is another manifestation. The photographs of that built project are yet another manifestation. The stories that are told after the project is done is yet another one. And I don’t really feel that, for us, there is a hierarchy to that. They’re just different parts of the life of an idea. And I don’t feel that photography has the sole purpose of monumentalizing or extending the life of something. It’s just another manifestation and it has very much to do with the eye of the photographer and their interpretation. Have you ever made an effort to capture all of the manifestations and represent that much fuller depiction of an idea? That’s an interesting question. We did a book about the Blur Building called Blur: The Making of Nothing [Abrams, 2002] and, because that project has such a great story from conception to demolition and beyond, we tried to capture artifacts of the process. It wasn’t intended to document all the manifestations, but in the end it did exactly that. It started with the manifestation of the first idea on the back of a paper napkin – a real cliche – and went through the complexity of the technical challenge which became its own mini-project and included everything in relationship to making a cloud stand still, the realization of the influence of the actual weather, to the strict legislation of the authorities who were pushing us to make a sprinkler system in the thing, to the construction of it, to the overheard comments, to the argument about the demolition and the final demolition of it. And then, finally, the chocolate bar which was eventually cast in the shape of the building and was considered a great sign of success in Switzerland. All of those manifestations are captured in that book and we have no regret that it was blown-up. That’s just part of its life. It’s interesting that you mention legislation. I suppose that’s one of the things that distinguishes your independent, art and theatre-based work from the architecture: in architecture the cast of stakeholders and decision-makers vastly expands and you’re forced to find ways to satisfy groups with totally different priorities and demands. In reference to your re-design of Lincoln Center in New York, you’ve said that throughout the approval process you gave the same presentation six times, but each time it was as if you were communicating in a different language. How do you adjust a set of fixed ideas for consumption by groups with differing and occasionally conflicting backgrounds and agendas? The experience of Lincoln Center, with all its complexity, made me realize that I was already speaking in many tongues. The message is always the same but the emphasis is a bit different depending on who the audience is. Its true that I did a lecture that basically showed the same fifteen to twenty slides of Lincoln Center six times in repetition and each time I inflected the delivery of the description in a slightly different way. The same content but different nuance – it’s kind of a Rashomon lecture. In the end, if you have an idea that is really good and that you believe in you can convince people just by simply understanding who you’re talking to, without dumbing down the message, without tricking anyone, without lying or deceiving, simply by pointing out different things in different ways. So the voices don’t condescend at all they just understand the value of different things to different audiences and constituencies. This particular project, because of its complexity, had to first of all get the buy-in of the Lincoln Center client, which is comprised of twelve, independent constituent organizations that share the same geographical location but are not bound together by any formal structure. They share only the mechanical plant; however, for any change to the campus they need unanimity. So I had to appeal to this group of twelve independent organizations, which was a feat in itself. Besides those groups and their directors and boards which were made up of hundreds and hundreds of people, the project was also partially on city property and used city funds so there was a structure that made our work accountable to a task force of the city commissioner, as well as each independent commission of the city, such as the planning commission, the cultural commission, the parks commission and so forth. So we had to get all of their buy-in at the same time. We also had to help raise money for the project, so we had to appeal to philanthropists and foundations and so forth. Because of legal designations related to Lincoln Center’s location we also had to appeal to the public through community boards. Then, beyond that, the project was historically sensitive so we had to constantly appeal to historical preservationists, as well as the press and the academic community and the profession. [Laughs] I think I’m answering more than what you asked, but it’s really, really complicated. That sounds like an absolute nightmare. [Laughs] Looking back, if I’d have known then what I’ve learned across the years, I probably would have been too intimidated to take on the project. I suppose that it was inevitable that you would cross paths with historical preservationists because your designs for Lincoln Center make several drastic alterations, the most obvious probably being that you opened up Alice Tully Hall and made it accessible to the street. Prior to this, Lincoln Center had been a more less closed-off from the city. I’m curious to know how you interpret that lack of engagement. What do you think Lincoln Center’s original design says about its architects’ priorities and the spirit of that time? It was designed at a time of massive urban renewal in New York. It was the time of [city planner] Robert Moses when there was a lot of new construction and very large areas in the city were being plowed down and homes and businesses were being displaced in order to build large housing projects, cultural projects, highways, and various other projects. In the case of Lincoln Center, the collection of architects shared a certain mindset toward centralizing the arts, which was an unusual idea that was pretty unpopular at the time, generally because even today we would say that it’s better to keep the arts dispersed rather than isolating them into one ivory tower campus. From an urbanistic standpoint, it was designed as a kind of hermetic place that was fortified from its context and that privileged the automobile at a very car-centric time. Many of the patrons of Lincoln Center were coming by automobiles from the suburbs and that explains the megablock planning where the cultural institutions sit on a plinth that houses the garage and the mechanical plant and winds all around Lincoln Center and produces an opaque face to the street. I came from a different generation that wants to democratize the arts and bring the city in and bring the cultural production that’s happening inside Lincoln Center out into the city. Our studio was in alignment with the leadership of Lincoln Center, which also was interested in breaking down those walls. I think that the effort, if one can generalize it, was to undo the bad urban planning of the late ’50s and early ’60s and relieve that opacity into a more communicative interface with the city in which the institutions and the city bleed into one another. One final thing about that project – I watched a talk that you gave at a TED conference in which you noted that Lincoln Center’s original designers were all men and said that part of the intention of your conversion was to decrease the level of machismo. How is machismo manifest in architecture? I think that at that moment in time there were something like ten nationally or internationally recognized male architects who were collaborating on the masterplan and designing the individual buildings. I think I mentioned that they produced a testosterone fueled architecture. I think it was called ‘monumental modernism’ because these architects came from the modernist period but they were also speaking within a design code of large-scale, stone, classically-oriented building projects. When we came to the campus we inherited this and there were only a few portions of Lincoln Center that I think ever resonated with the public and continue to resonate. These were not time-specific: they were mostly social spaces at the promenade level which were less about the monumental buildings and more about making a kind of buzz and intersecting all these streams of people into a common spectacle during intermission or just before and after a show. We liked that aspect and so our interest was less on the hard issues of architecture as opposed to the soft, social and cultural issues. I don’t mean soft as in female-male or that kind of cliche, but more about the relationship between architectural matter and atmosphere and other not representable qualities. That’s what was interesting to us and that’s where we wanted to go forward. How do your experiences as participants in visual and performance arts influence your approach to designing cultural venues like Lincoln Center or the ICA? The studio has a lot of empathy for the artists and curators and artistic directors, musicians, performers, and all of the people who occupy the other side of the museum or concert hall wall. Because of that we try to temper our voice a little bit to enable the multiple voices that occupy these spaces to be heard. We’re strongly against big signature gestures that are heroic and overly sculptural and that restrict the re-scriptability of certain spaces. It’s always a kind of magic trick of trying to find – or maybe it’s not a magic trick, maybe it comes from analysis and thinking and experimentation – trying to find how much voice is enough and when to pull back. With each of our projects we strongly feel that we have a lot of say and we have the expressive tools to say it, but it doesn’t have to be audible all the time. We continue to find ourselves on the other side of the museum wall playing the role of artist or collaborators in theatrical performances and we always want to have a lot of tools at our disposal. We don’t like to have any limits and our architecture tries to reflect that.